You are always on top of things. Great PSA. We hope Irene decides to turn East and head out to sea. Very good info. Better to be prepared and hope it is all for nothing. We are keeping our paws crossed wishing safety to all of you who are in the pat of this big storm. Thanks five sibes for the information too. Great post! Thank you so much for the reminder and all of the great links! Wow, great reminder to everyone! I hope all pets and peeps will stay warm, dry and safe through this storm. Thanks for the info! We send White Dog positive energy that all our East coast friends stay safe and take the fantastic advice that you posted...this information is VITAL! Great post! 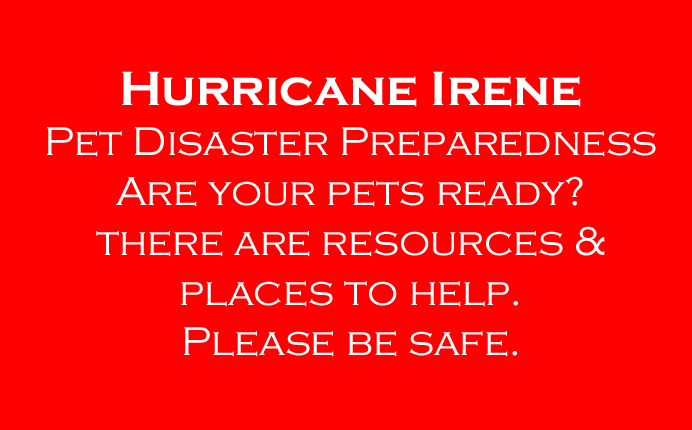 We hope that all of our friends on the East Coast stay safe in the upcoming days! 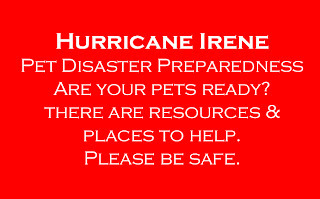 Not that we expect to have to evacuate, but Irene is on track to pass right over us. Mom's got just about everything ready, just in case. I have a few good tips on my blog today too. Great info. Unfortunately itlooks like there are many who are going to be needing this information. Paws crossed for everyone to be safe. Thanks for those tips. We are not accustomed to the big winds here and it is good to have a list of things to do to get ready. I like your updates! I checked out my local resource page on facebook and they seem to have it all covered too! I don't know how you do it, but you always share great info when it comes to pet safety. So glad you made this info available to folks. I cannot imagine leaving my dogs behind, but I know for a lot of people there seems to be no alternative. So much has changed since Hurricane Katrina. So many more resources are available to folks. Your list is awesome.